You may have noticed that the blogroll link to Thomas Sowell has been broken for a long time - which implies that I haven't read him for a long time. Both were greivous errors that have now been rectified. When I used to work for Domino's Pizza, one of my best friends was a store manager at a different store. Among the responsibilities of a manager, which are legion, is the requirement to keep the place clean. He was good at it, the job as a whole, that is, but one thing his area supervisor was always riding his back about was a few spots of dried pizza sauce that were always on the wall behind the line where the pizzas were made. No matter how good a job he did cleaning the place, at keeping labor and food costs in line, at providing great customer service, at keeping the supplies stocked and the employees happy, these few small spots would always remain. I remember he had this almost Zen-like idea that those spots symbolized something. Anyone who manages that kind of establishment, especially one in which the duties are defined externally, knows that there are more duties required of a manager than he could ever fulfill, and that if he tries to fulfill all of them to the letter, few or none of them will be done right. All abstractions leak. Or, any theory capable of expressing elementary [principles] cannot be both consistent and complete. Or, reality is an integrated whole; any identification of reality is a selected subset with something left out. This sauce on the wall represented the leak in the abstraction of what a manager's job is. He could do everything else required of him, but he could not clean that sauce. It was almost as if cleaning it would undermine the entire edifice, make it all fall apart, and he'd be unable to get anything else done. Sometimes, if that leak is the one that has to be there, then plugging it undermines the value of the abstraction and renders useless the set of principles defined by that abstraction. Was that blogroll link to Sowell my leak? I don't see how it could have been. On the other hand, it was a trivial thing to do - it took 30 seconds once I decided to do it - yet I had seemed to be subconsciously averse to fixing it until now. At the same time, I've felt a fundamental shift in how I approach philosophy and politics. Maybe my old abstractions are no longer useful, and there's no reason not to finally clean the sauce off that wall. "I'm Gonna Break You Off Someth'n Proper"
Mike Lee bears watching. This monologue is quite remarkable, but any remarks I could make would be unnecessary - he can speak for himself... and then some. This is just anecdotal evidence, but I have to wonder if the economy is really going gangbusters lately. I can't swing a dead cat around here, (Tucson, AZ), without seeing a help wanted sign. I passed a movieplex on my way home from work, and the marquee was flashing, not movies, but "Now Hiring". I switched jobs myself about a year ago, and in the process had put my resume on Monster and Dice. It was no bites, and no dice respectively back then, but in the last several weeks, I've gotten at least two phone calls and emails each week about specific positions (usually up in Phoenix). I'm in IT, one of those laid off in the endgame of the Dot Bomb, and have seen the the industry slowly picking up since about 2002, but this and the help wanted signs everywhere is remarkable. Is it just my area, am I imagining things, or is this happening all over? The Sipples allegedly caught Kennesaw police officer Richard Perrone speeding up to 17 mph over the speed limit. Perrone alerted Bartow authorities, who in turn visited the Sipples' home to tell them Perrone intended to press charges against them for stalking. Try that next time you get a ticket. Silly people in Georgia, dontchya know your masters play by different rules? UPDATE The cop withdrew the complaint. I guess those special rules arent in effect... yet. At least not when somebody calls their bluff. I've been seeing this guy soaring through the neighborhood quite a bit lately. I have a dry wash running right alongside the house, and his favorite spot is right on top this telephone pole, looking straight down along the wash. Sorry for the picture quality, I was shooting almost straight into the sun on max zoom with a medium-level digital, and Photoshop can only do so much. He (or she - I saw a pair of them flying around together, only once, about two weeks ago) is really hard to catch in the air. Three times I've seen him going about his business, flying past me as close as 20 feet. It's one hell of an impressive sight - I put the wingspan at a conservative 3 feet, but it could be more - but I couldn't get to the camera in time. 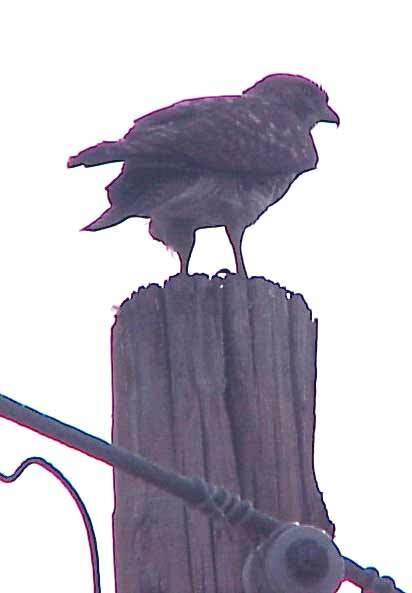 I'm guessing it's a Ferruginous Hawk, but I can't be sure. If so, that three foot estimate for the wingspan is probably way too conservative. In any case, I'd like to offer him an all you can eat pass to my back yard. Those prarie dogs are cute and fun to watch and all, but I don't need quite so many of them. Edit: What do you know, I was just poking through these links and discovered that them little buggers I've been calling "prairie dogs" are actually Harris's Antelope Ground Squirrels, listed as one of the favorite foods of my Ferruginous Hawk. Learn som'n new every day. The latest annoyware plague on the blogosphere is Snap previews. If a site has them, hovering over the link pops up a window with a thumbnail of the site the link goes to. There's really no point to it - the thumbnail is too small to read anything, and there's no other benefit I can think of. It just gets in the way. I can hover over a link, or read the text before and after the link, but not both when the damn popup blocks whole paragraphs. The only problem is that it relies on a cookie being present to block the popups (it's malware: opt-out, not opt-in). I tried editing my hosts file to send any requests to their site into the ether, but it wouldn't take in Firefox for some reason. YouTube has removed the second of the videos that was embedded in my last post, Gnarls Barkley's "Crazy", on Letterman last summer, for copyright violation. It's a shame, because this was a great performance, far better than the version on the album, and showing a stage presence and confidence that was a joy to watch, and which of course could not be conveyed in only audio. This is an aspect of the war for intellectual property rights which is raging these days. Of course the artists, and anyone they contract with for such things, have IP rights in their works. But I wonder whether, in a world in which rights were generally respected, where fighting for the concept of rights didn't require fighting tooth and nail for every concrete manifestation of rights, the record companies would find that it was to their benefit to let some things slide up to a point. Ask yourself how many others that might pertain to in some way. Then ask, are the record companies better off if I (and others like me) had never seen this? This war has become incredibly nasty. The sharers and pirates and bootleggers have gone way beyond "fair use" into outright organized theft. In response, the industry, with the complicity of government (of course), has gone way over the line of what is morally permissible in attempting to defend their own over-broad definition of their rights. There's collateral damage in this war, and quite a lot of it to those who fight for the letter of the law of their rights so hard that they forget what the point of those rights is in the first place. And the artists themselves, the fountainhead of these produced values, are caught in the middle. The good news is that there probably won't be any record companies in ten years. They provide four basic services, as far as I can tell: Selection of artists, recording and production of media, promotion, distribution. The first is only necessary a-priori when the resources for the other three are limited. They are not, and so now that function can be performed at the consumer end. Anyone can record and produce professional music, on any available media today, with a pretty small investment. Distribution is handled just fine by the internet, with iTunes leading the way. Promotion is still an iffy thing, but the internet is quickly taking up the slack on that as well. That leaves the record companies as middle-men who no longer provide any value to the transaction. They're dinosours who haven't had the decency to go extinct yet. Their legal maneuverings are mostly designed to stave that off. Rather than protect anyone's rights, their purpose is to maintain their rent-seeking position, no matter whose expense it comes at. UPDATEAnother version that appears to be the "official" version is still up on YT. My comments on the larger issue of the IP wars still stand.